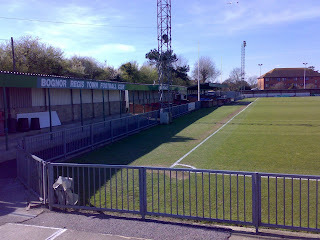 Bognor Regis Town FC are a non league football club who were formed in 1883 who come from the seaside resort of Bognor Regis in West Sussex. The club were originally known as Bognor FC, joining the West Sussex League three years after their formation. 'The Rocks' won that league title for five consecutive years, before having a season in the Brighton & Hove District League and then becoming members of the Sussex County League in 1927. 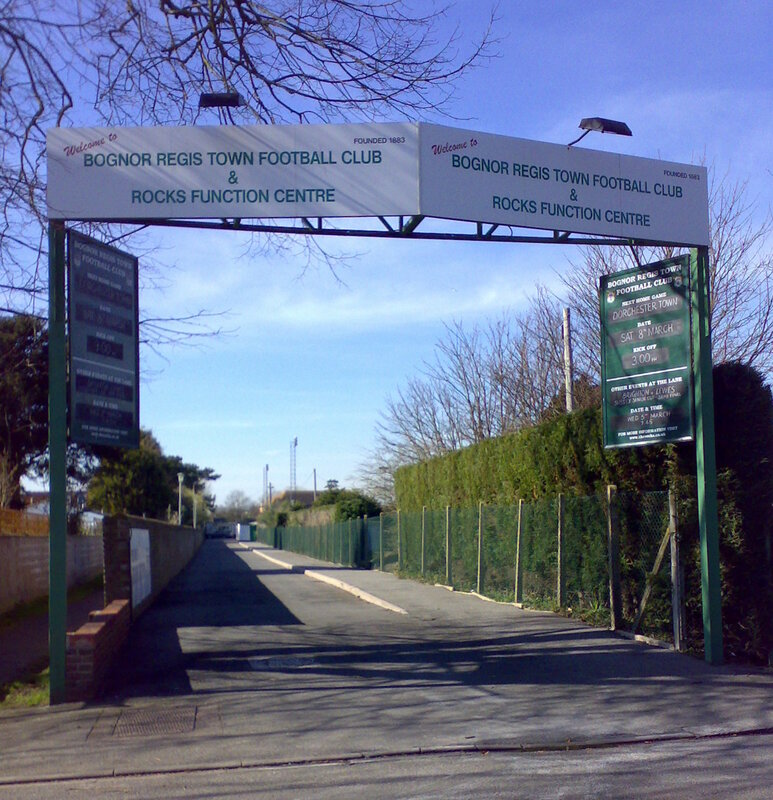 Two years later the club was renamed Bognor Regis FC following King George V's addition of Regis to the towns' name. 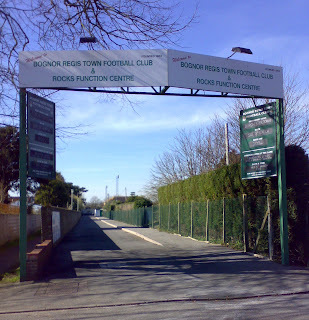 Following the lifting of the Sussex County League title in the 1948-49 season the club became Bognor Regis Town. In 1970 the side were relegated to the leagues' Second Division, but they went straight back up at the first attempt. They were crowned champions for a second time in 1971-72, which led to a promotion to the Southern League. In 1976 Jack Pearce became team boss at the age of 26, a position he held for the next thirty one years. Bognor moved sideways to join the Isthmian League for the 1981-82 season, winning promotion to the Premier Division in their debut season. 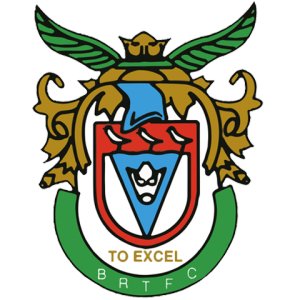 The season of 1984-85 saw The Rocks reach the second round of the FA Cup, where they were defeated by Reading 6-2 at Elm Park after defeating Swansea City in a Nyewood Lane replay. They went on to reach the same stage the following season by defeating Enfield and then going down 6-1 at Priestfield Stadium against Gillingham. In 1988-89 they managed to achieve the same feat. This time Exeter City were beaten on the coast before Cambridge United came to town and left with a 1-0 win. In 1991-92 the club were reprieved a relegation when the then separate clubs of Dagenham and Redbridge merged. However, they went down the season after. In 1995-96 Town reached the second round of the FA Cup for a fourth time. This time the run ended away to Peterborough United. In 2003 they regained their Premier League place and the following year Bognor became founder members of Conference South. In August 2008 a suspected arson attack destroyed the clubhouse at Nyewood Lane, which seriously affected the finances at the club which Pearce was now the General Manager. This led to relegation back to the Isthmian League an a further successive demotion. Promotion was won via the end of season play offs when Dulwich Hamlet were beaten in the final. 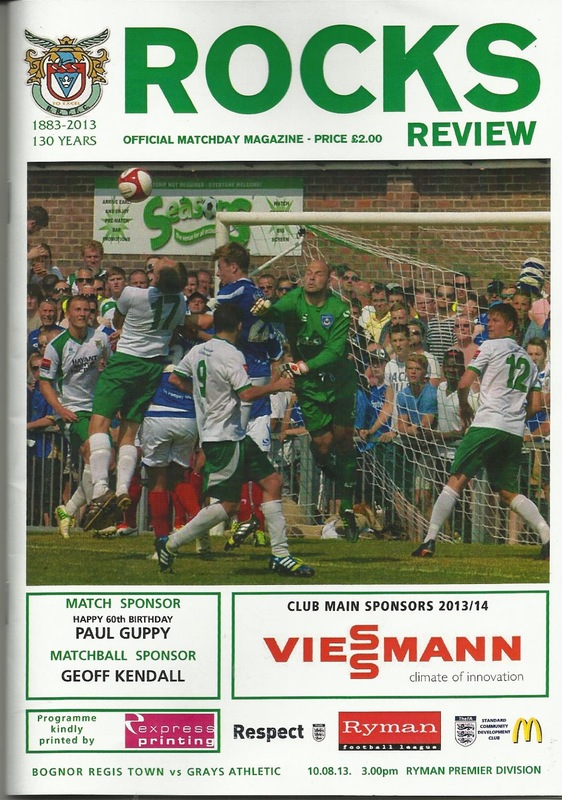 The Rocks followed that up with a season of consolidation in the top flight. 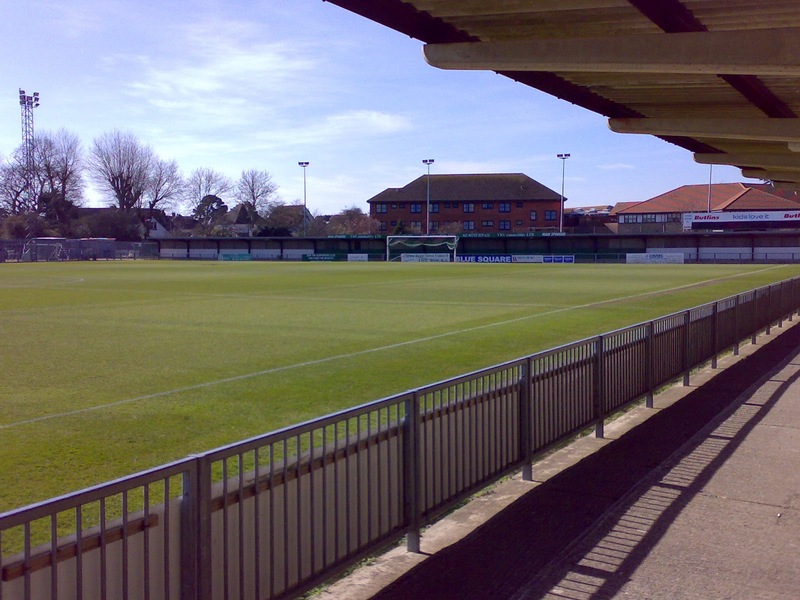 Bognor Regis Town FC will play in the Isthmian League Premier Division throughout the 2013-14 season. I had the day off work and had previously obtained a Southern Rail day saver, which entitled me to unlimited travel for the day on their services for just a tenner. The weather was relatively kind but chilly as I arrived at the seaside after my previous call to Arundel. Bognor was like so many seaside towns that had once been the destination for thousands of visitors, but had hit harder times of late. The walk to Nyewood Lane was pleasant enough through some nice streets and avenues. The ground was open on my arrival, with some gents working around the clubhouse area. I later worked out that one of the gents was Jack Pearce. He was most welcoming when I told him the club I supported and said, "It's always nice to see a Seadog." He had been on FA committees who had dealt with the shambles at Scarborough FC and in hindsight I wish I'd tried to pick his brain. Instead, I got on with taking photos of the smart arena. The Clubhouse End was the first area I came across from Nyewood Lane. It was open with a couple of steps of terracing and a few picnic tables. The far touchline had a long narrow cover for standing spectators bordering a sports ground. There was a similar cover over the far end behind the goal. The final side had a mixture of open standing, two seated stands and a small cover for those preferring to stand. The pitch was absolutely immaculate. I said my thank yous and took the opportunity of walking back to the station via the sea front. To be totally honest it was very disappointing. There were car parks and a promenade, but not a lot to do for potential tourists. I hoped for the businesses of the town that redevelopment was in progress. I arrived at the station ready to catch the next train to Chichester, via a change at Barnham. While doing my night shifts earlier in the week I scanned the fixtures and tried to find a game at a ground I'd been to without seeing a game, as that was my game plan as often as possible for the 2013-14 season. Ideally I also wanted one that was just that bit too far on a midweek work night. The train times and prices for Bognor Regis looked ideal, so I booked a return for £15 and took the option of the 12.32 out of Victoria. It was a lovely day for football; bright with a breeze and warm, but not overpowering. The trains ran on time and I found the added bonus of an alleyway that would save me at least a five minutes walk to the ground, which brought me out opposite its entrance. The gent gave a nice smile and a "Good afternoon", which always puts me in a decent mood, yet it's amazing how many places don't bother with this simple but polite welcome. I paid £9 admission and bough a decent programme for another couple of quid. I had a brief look inside the Seasons clubhouse, which was neat and tidy, but I decided against any alcoholic beverage. Instead I decided to try out the cafe, which had a good reputation. Indeed, my steak & kidney pie, chips and a cup of tea for £4 represented decent value and was of a good quality. Before kick off I had a wander around the ground to take my photos as youngsters took part in games on the immaculate playing surface. They were forming part of the Sir Bobby Robson National Football Day. This was a tribute to the great man, with the emphasis been on youth football. The audible PA man filled in the details as well as informing the crowd that the Nyewood Lane pitch had been voted the best at non league steps 3 and 4 throughout the whole country, which was some accolade. 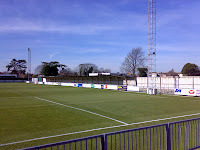 The match promised to be an interesting encounter, as the visiting promoted Grays had changed manager over the summer after winning Division One North the previous season. If they played as well as their new kit looked, then they would be all right. 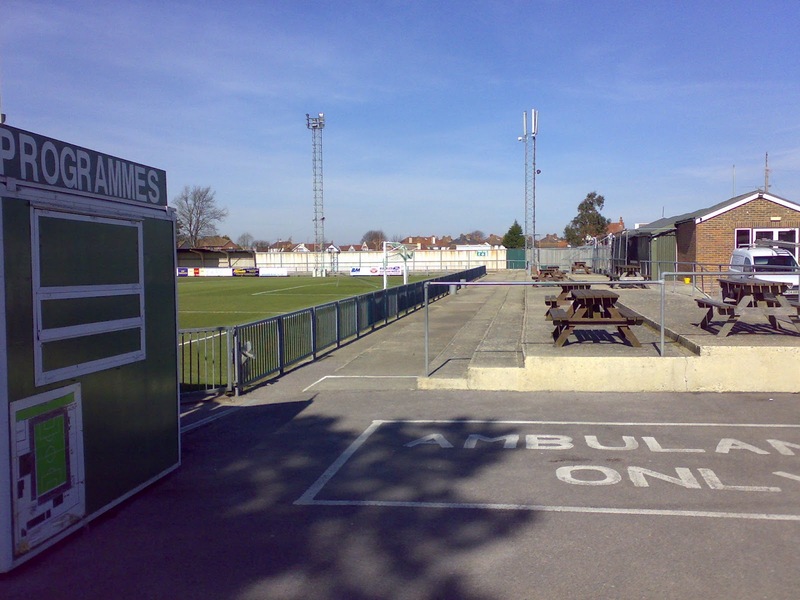 I was also impressed that Nyewood Lane had another entrance in the opposite corner to the main one, as well as a secondary drinks kiosk that was open. The Rocks kicked off defending the Clubhouse End and had most of the possession. Giant centre back Stuart Axten had a free header from a corner blocked, while winger Aaron Hopkinson was tormenting the senior Grays player- assistant manager Lee Flynn with his pace, but the end product wasn't there. Athletic had moments of their own when they ran at the suspect Bognor defence. It was the visitors who took the lead when Joao Carlos got free in the box and slotted home, to the delight of the forty or so fans from Essex. The locals had some vocal backing between the goal that they were attacking as well as plenty of older fans down the side who were constantly berating the officials for their perceived injustices. Harvey Whyte was close to equalising with a curling shot as the Grays defence did a reasonable job of restricting Town's attempts on goal. Half time was spent catching up with scores from elsewhere including a catch up on Scarborough Athletic's seaside derby friendly at Whitby. The bar was doing a good trade, as patrons were allowed to take their drinks onto the terracing at that end. The PA man read out lots of announcements in a style that was not dissimilar to Peter Denyer's character 'Ralph' in Dear John. Grays made a couple of changes at the interval, including the entry of Junior Baker at the back; a player who'd impressed me on the two previous occasions I'd seen him in action. Bognor continued to feed Hopkinson, but Flynn made up for his lack of pace by reading the game well and getting assistance from his team mates. Bognor had a couple of decent attempts on goal, but George Kamurasi saved well. I had my doubts about The Rocks back four from kick off. Their passing was loose and it looked to me that there were plenty of gaps to exploit. A more ruthless team than Grays would have caused them real problems with more searching passes. However, The Blues did find their way through once more, by courtesy of Jack West who went through unchallenged and finished neatly on sixty four minutes. The home team had the stuffing knocked out of them and their forward play lacked any real potency. Grays made it three as a seemingly harmless free kick from substitute Apron Ramos-Gonzales bounced past players from both sides and keeper Mark Zawadski to nestle into the corner of the net. The game was petering out when I made a move with the electronic scoreboard displaying that there were three minutes remaining. The noise of the crowd followed my most of the way back to the station, where I was a few minutes early for the 5.07 service. I was back indoors in Kingsbury at 7.30 after a nice sleep on the journey home in time for another couple of hours shut eye before work. I'd had a very pleasant afternoon by the seaside and I would think I'd sleep rather better than the Bognor defensive coach!